There are numerous methods and technologies adapted for the measurement of fluid flow, each with its own set of positive attributes and limitations. Understanding the basic operating principles behind each is useful for effective selection of a technology to be applied on a specific application. One technology long employed for continuous fluid flow measurement is thermal dispersion. The operation of a thermal flow meter is as simple as placing a heated object into a moving stream. The amount of heat drawn away, or dispersed, from the heated object is a measurable quantity that is directly proportional to mass flow rate. This is similar in concept to a principle commonly observed in wind chill where someone perceives the temperature to be colder than it actually is at the moment of measurement. 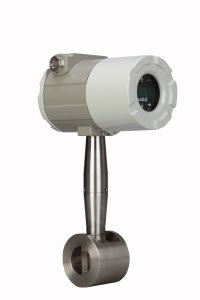 One example of a thermal mass flow meter is a hot wire anemometer, with which air speed is measured via a metal wire charged with an electric current. The faster the air moves around the wire, the more the temperature of the wire will correspondingly drop. The electrical power required to keep the temperature of the wire constant is directly proportional to the flow rate of the air moving past the wire. However, thermal flow meters are inherently used to measure mass air flow and not volumetric air flow. A common application of thermal flow meters is mass air flow measurement for combustion control, such as in engines and boilers. Maintaining fuel to air ratios in a range resulting in efficient combustion is essential to controlling fuel costs and the level of regulated emissions. Keeping combustion efficient relies on a controller’s ability to modify the combustion air mass flow rate to match the demand for fuel under changing load and input conditions. Thermal dispersion technology can be applied to gases or liquids, making the range of applications very broad. Typically, thermal mass flow meters used in processing industries will have a flow tube or insertion probe with two temperature sensors, one which is heated and the other which is not. The heated sensor serves as the mass flow sensor, meaning it will cool at a rate directly dependent on mass flow. 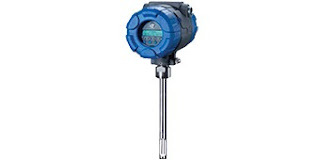 The purpose of the second temperature sensor is to deliver an accurate measure of fluid temperature. Various processing methods are employed to determine the degree of thermal dispersion, but all are related to the same basic principal. 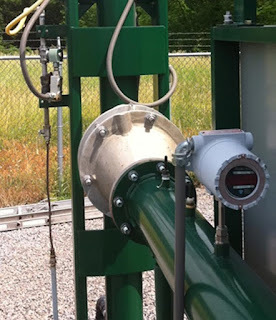 One of the best applications for thermal mass flow meters is at a particular point of a flow stream, where the flow meter can be inserted or installed to measure a specific amount of fluid being used in the process, such as the amount of gas being sent to a flare. 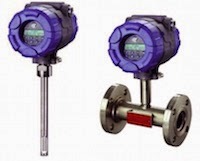 Their design simplicity and ease of production allows thermal flow meters to be very compact. Some are even coupled with built-in throttling mechanisms and other control devices, incorporating measurement and control functions into a single integrated device. Share your flow measurement requirements and challenges with an instrumentation specialist, combining your own process knowledge and experience with their product application expertise to develop an effective solution. Knowledgeable individuals that share expertise and experience with others in their field are a valuable resource, worthy of our attention. Will thermal mass flow meters be affected by changes in the composition of gas (i.e. will they require recalibration every time the composition changes)? Thermal mass flow meters measure a flow rate based on convective heat transfer. Fluid properties are some of the many factors that influence convection. Each gas has unique properties, which is why these flow meters are calibrated for a specific application. You would not want a meter calibrated for an air application placed into a natural gas application without recalibration or some type of field adjustment if applicable. All gas mixes are not created equal. If you had a gas mix with high hydrogen content, a variation in hydrogen would have a much greater effect than typical variation in natural gas content. Hydrogen has a tendency to create more heat transfer than most gases. For natural gas, it is common to have some slight variation in composition between the calibration of the device and the application itself. However, the effect is minimal for slight changes in methane or ethane at different times of the year. Natural gas fuel flow is one of the most prevalent applications for thermal mass. Based on our experience, the biggest cause of malfunction in flow meters is improper installation. If you do not install a flow meter per the manufacturer’s recommendation this will greatly influence the performance of the meter. For thermal mass, this includes proper straight run, depth into the pipe (insertion probes) and flow arrow alignment. 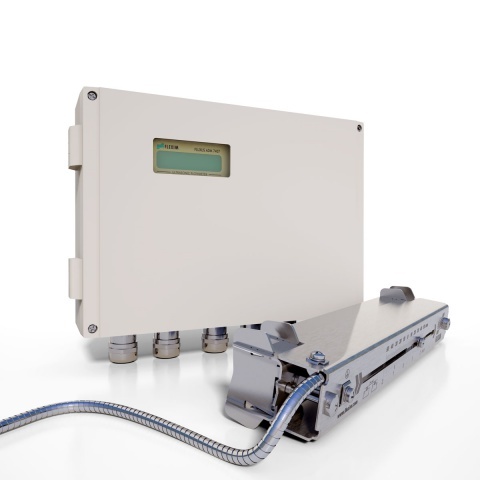 Each application presents unique difficulties for every flow meter technology, and each end user has unique needs. There is no exact answer as to when a recalibration would be needed for thermal mass flow, as it is application dependent. You do not always need recalibrations for variation in gas composition. What role do thermal flow meters play in emissions monitoring applications? Thermal flow meters are at the forefront in flow measurement for emissions reporting and energy management projects. The energy management arena spans many markets, including some of the largest in the oil & gas and power industries. Some popular applications include monitoring gas fuel flow to a combustion source to report SO2 (sulfur dioxide) emissions, stack (flue) gas flow in power plants as part of a continuous emissions monitoring (CEM) system of NOX (nitrous oxide) and SO2, and flares in a gas field that need to be reported to environmental authorities. These applications prove difficult for many flow meter technologies. For example, in a flare application most of the time gas is not being flared off, but it needs to be measured in case of an event. The user will want to monitor the low flow of pilot gas keeping the flare lit. This requires a flow meter with a very high turndown with good low flow sensitivity, which is a limitation of some technologies, such as differential pressure flow meters. Many operators are most concerned with measuring CO2 (carbon dioxide) emissions. However, with thermal flow meters we are increasingly finding applications with the need for methane measurement. Methane is a greenhouse gas that has more than 20 times the global warming potential as CO2. No longer can coalmines or landfills emit this directly to the atmosphere. If not flaring the gas off, the owners are beginning to capture it, treat it, and produce usable natural gas from it. Some facilities that emit landfill gas, or facilities that produce biogas, are involved in carbon credit programs or clean development mechanisms. Similar applications can be found in wastewater treatment plants where customers are reporting digester gas emissions and even capturing this gas to produce electricity and reduce energy costs. Thermal dispersion flow meter technology, such as the MAGNETROL Thermatel® TA2, has become well accepted in all of these markets. Ultrasonic flow meters are utilized throughout the fluid processing industries, as well as for compressed air and energy monitoring. The non-invasive nature of the sensor installation couples with sufficient accuracy and low maintenance requirements to give this technology a competitive edge for many applications. Producing consistently accurate results with an ultrasonic flow meter depends heavily on a proper installation. 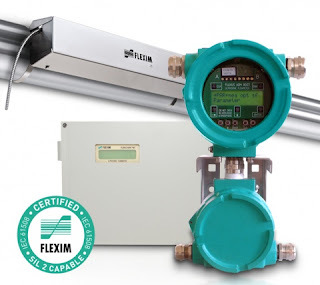 Flexim, a globally recognized leader in the manufacture of ultrasonic flow meters, provides us with a video that steps through the installation process, with recommendations and guidance along the way. Flexim manufactures a full range of ultrasonic flow measurement equipment and instruments for industrial and commercial applications. Share your flow measurement challenges with process measurement experts, combining your process knowledge with their product application expertise to develop effective solutions. Thermal dispersion mass flow meters provide an accurate means of mass flow measurement with no moving parts and little or no encroachment on the media flow path. There are a number of different configurations to be found among various manufacturers, but all function in basically the same manner. Two sensors are exposed to the heat transferring effect of the flowing media. When the media composition is known, the mass flow can be calculated using the meter reading and the pipe cross sectional area. One of the flow meter sensors is heated, the other is allowed to follow the media temperature as a reference. The heat dispersion from the heated sensor is measured and used to calculate mass flow. Share all your process measurement challenges and requirements with product application specialists, combining your process knowledge with their product application expertise to develop effective solutions. 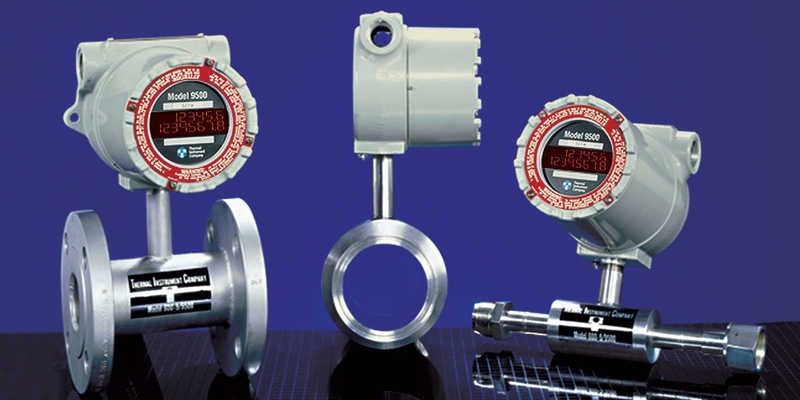 Precision turbine flow meters are specially designed to accommodate a broad range of precise fluid measurement applications. 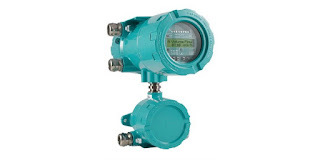 They accommodate greater flow rates with lower pressure drops than other meters in their class. Some have a self-flushing design for longer sustained accuracy. The turbine's high-frequency digital output is suitable for interfacing with an assortment of readout and recording equipment. 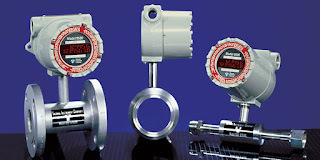 Some turbine flow meters have a symmetrical bi-directional design that supports reverse flow applications without a reduction in accuracy or capacity. Fluid flows over a diffuser section and is accelerated onto a multi-blade hydro-dynamically balanced turbine rotor. The rotor speed is proportional to the volumetric flow rate. As the rotor turns, a reluctance type pickup coil (mounted on the meter) senses the passage of each blade tip and generates a sine wave output with a frequency that is directly proportional to the flow rate. The rotor is the only moving part of the turbine flow meter. The small lightweight rotor hubs ensure fast response to process flow changes. The rotor is hydro-dynamically balanced during operation, eliminating the need for mechanical thrust leveling. This low-friction design improves metering linearity and reduces wear and maintenance. A variable reluctance generating pickup coil contains a permanent magnet and a wire winding. In some cases, the rotor blade of the turbine meter is made of a ferritic stainless steel such as grade 430. The movement of the rotor blade in proximity to the magnetic field of the coil tip produces an AC type voltage pulse within the coil winding. An alternate arrangement finds the ferritic bars embedded in the rotor shroud, where they can interact with the pickup coil. Increasing the quantity of bars on the shroud to outnumber the rotor blades provides more pulses per unit volume (resolution). This feature can be valuable when proving large-capacity meters with a small-volume prover. Shielded wire cable conveys the output of the pickup coil to compatible electronic instruments to indicate flow rate, record, and/or totalize the volumetric flow. The coil itself does not require electrical power to operate. The meter may be factory-fitted with multiple coils for redundancy, indication of flow direction or pulse train verification. The pickup coil type and magnetic strength vary with application requirements. The turbine flow meters are calibrated in a horizontal position. Therefore, the best correlation of calibration occurs when the meter is operated in this plane. However, the meter will operate satisfactorily in any position. The maximum and minimum system pressures must be considered when applying the turbine meter. To obtain proper response, a back pressure should be applied to the meter. This back pressure should be at least twice the pressure drop of the meter at maximum flow. For liquid meters, the back pressure should be twice the pressure drop of the meter at maximum flow, plus twice the fluid vapor pressure. Turbine flow meters, with their simple, durable construction and wide operating range, may be the right choice for a number of applications. As with all instrumentation, there are a number of factors to consider when making a selection. Share your flow measurement challenges and requirements with instrumentation specialists, combining your process knowledge with their product application expertise to develop the most effective solutions. M.S. Jacobs includes the Azbil North America line of process measurement and control products in its offering. One of Azbil's flagship products is the AX series of multivariable vortex flowmeters for industrial process measurement and control. 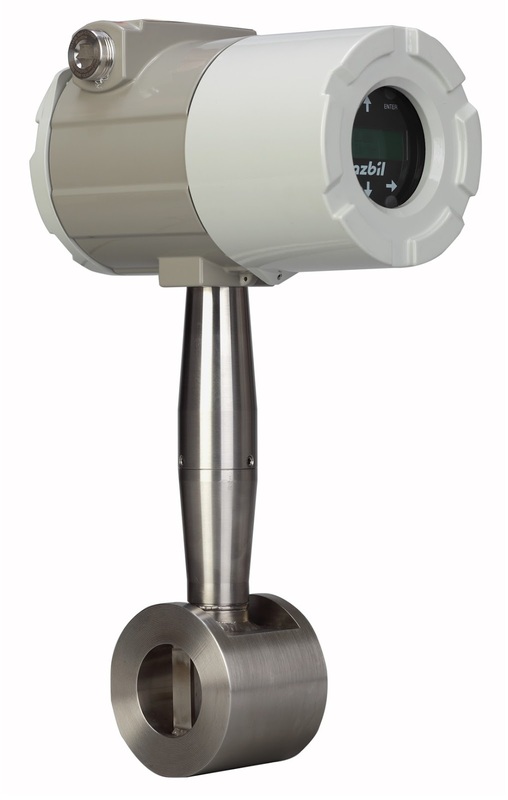 The instrument combines temperature, pressure and velocity measurement in a single instrument to provide accurate mass flow measurement of gases, liquids and steam. When compared to arrangements with discrete instruments for each variable, incorporating several variable measurements into a single package reduces potential leakage points, installation complexity, and space requirements . Configurations for in-line or insertion installation are available for line sizes ranging from ½” to 8” for in-line and 2” and greater for insertion. A sizing guide, application and product configuration assistance is available from the product specialists at MS Jacobs. Industrial process measurement and control operations present a continuous stream of challenges to designers, engineers, operators, and equipment manufacturers. The innumerable combinations of environmental, safety, financial, and other concerns have lead to a wide variety of instruments, equipment, and techniques for meeting specific process requirements. A critical element of many industrial processes is the measurement of liquid flow. Matching the best available flow measurement technology or product to an application calls for through knowledge of the process, the medium being measured, and the strengths and limitations of a proposed measurement device. The most current product and application information is available from specialists in flow measurement. The video illustrates how a special adaptation of ultrasonic flow measurement technology is utilized to measure extremely low flow rates. Specific product information is also included, showing the advantages and specific application ranges of this specialty product from Flexim Americas. Applied extensively in industrial process measurement and control, a rotameter is an instrument that uses a float of given density to establish, for any measurable flow rate, an equilibrium position within the fluid stream where the force of the flowing fluid equals the force of gravity. Let's break that down a little. A rotameter has a tapered tube with a float inside. 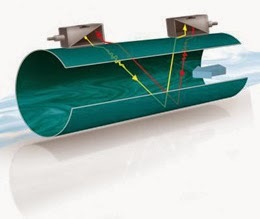 As the measured fluid flows upward through the tube, it pushes the float upward along the length of the tube. As the float rises in the tube, the cross sectional area of the tube increases and more fluid can bypass around the float. At some point, the upward force of the fluid flow acting on the float will balance with the downward force of gravity. The position of the float along the length of the tube correlates with a certain flow rate when certain properties of the fluid are known. Flow rate scale graduations on the tube can be read by the operator. Rotameters are very specific to each flow measurement application. It's important that you know your fluid properties, ambient conditions, connection and readability specifications. For each application, it's advisable to work closely with a sales engineer to gather all the needed information and coordinate the product selection process. Industrial process control frequently requires the accurate measurement of fluid flow. There are several widely applied methods for measuring flow, each having particular advantages which may apply to a specific application. Transducers can be clamped on exterior pipe surface where measurement is needed. Non intrusive measurement technology prevents contact between media and measuring elements. No significant pressure drop associated with measuring device installation. Comparatively higher cost than some other technologies. Fluid characteristics must be well known for proper application. Pipe cross section must be completely filled by media to acquire accurate flow measurement. Learn more about this process measurement and control technology in the product detail sheet below. Consult with a product application specialist for more detailed product information and tips on how to best apply ultrasonic flow meters to your process. Whether it's high viscosity crude oils, ultra-low flow conditions or applications at the extremes of temperature, Cameron's new CamCor™ range of Coriolis flow meters deliver value beyond the whole-life operational benefits associated with non-mechanical architectures. CamCor comes in two architectures, CamCor CT for custody transfer, where the emphasis particularly is on high accuracy, and the Cameron CamCor PRO for process operations. CamCor CT offers flow rate accuracy of ± 0.1% for liquids, as a result of its deep “U” shaped dual sensors, with outstanding zero stability performance (0.071 lb/min for 2” model). The range includes models purpose-designed for application extremes, covering temperatures from -200°C (Cryogenic/ LNG) up to 350°C. Nominal sensor sizes go from less than 2mm to 250mm, with 1/4” to 10” end connections, offered in ANSI class 150 to 900, other flange types, threaded, or Tri-Clover. The unit is manufactured of 316/316L stainless steel and Hastelloy Alloy C22. +/- 0.2% and density accuracy of +/- 0.003 g/ml. 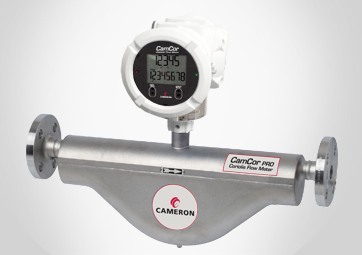 It comes with the same transmitter, output, communications, diagnostics and configuration as the CamCor CT and is available in four nominal sensor sizes, from 6mm to 50mm, with 1/2” to 2” end connections in ANSI flanges and Tri-Clover. Review the product brochure below, or contact a product specialist for more details or a discussion of your application. A new multivariable vortex flowmeter has recently been added to the product line at MS Jacobs & Associates. It is intended for industrial process measurement and control. The AX Series, from Azbil North America, utilizes a vortex shedding velocity sensor, solid state pressure transducer, and resistance temperature detector in a single unit to allow accurate measurement of mass flow in gases, liquids and steam. 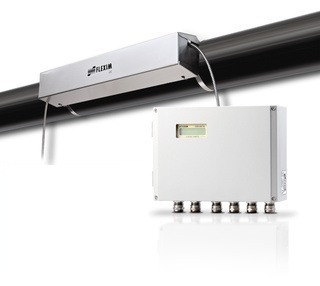 The combination of multiple variable measurement in a single package simplifies installation and setup cost, while reducing potential leakage paths of an arrangement employing separate instruments for each variable. The AX Series is available for in-line or insertion installation. Your product sales engineer can provide a sizing guide and other assistance in selecting and configuring the best product for your application. A rotameter is one particular type of variable area flowmeter that measures flow by varying the cross-sectional area a fluid or gas travels through in a closed tube. Is a simple device that can be easily manufactured out of inexpensive materials. The clear glass tube is resistant to thermal shock and chemical reaction. Must be mounted vertically, with designated top and bottom, and with the fluid flowing from bottom to top. Graduations on a given rotameter are only accurate for a given substance at a given temperature. Separate rotameters must be used for fluids with different densities and viscosities, or multiple scales on the same rotameter must be used. Resolution is relatively poor and gets worse near the bottom of the scale. Oscillations of the float and parallax lend to reduced accuracy. M.S. Jacobs and Associates, Inc.
A rotameter, also known as a variable area flowmeter, is a device that measures the flow rate of liquid or gas in a closed tube. It measures flow rate by allowing the cross-sectional area the fluid travels through, to vary, causing a measurable effect. They are a cost-effective flow measuring device that provides excellent repeatability, requires no external power, can be made from a wide variety of materials, and may be designed for high pressure and high temperature applications. Inspect meter for damage that may have occurred during shipping. Report any damage to the container to the freight carrier immediately. Make sure your pressure, temperature, fluid and other requirements are compatible with the meter and components (including o-rings). The weight of related plumbing. Thermal expansion of liquid in a stagnated or valve isolated system. Instantaneous pressurization which will stress the meter and could result in tube failure. note: In closed thermal transfer or cooling systems, install the meter in the cool side of the line to minimize meter expansion and contraction and possible fluid leaks at the threaded connections. Handle the meter carefully during installation. Use an appropriate amount of teflon tape on external pipe threads before making connections. Do not use paste or stick type thread sealing products. Over tightening of plastic connections may result in fitting damage. Install the meter vertically with the inlet port at the bottom. Meters with stainless steel fittings will support several feet of pipe as long as significant vibration or stress resulting from misaligned pipe are not factors. Meters with plastic fittings must be installed so that fittings are not made to support any part of the associated plumbing. In addition, meter frame should be fastened to bulkhead, panel or column. Meters used in gas service should have suitable valves plumbed in at the inlet and outlet of the meter. These valves should be no more than 1-1/2 pipe diameters from the meter ports. The valve at the outlet should be used to create back pressure as required to prevent float bounce. It should be set initially and then left alone. The inlet valve should be used for throttling purposes. Depending on the installation, valves may not be essential, but they are most useful in many installations. Remember: To get a correct reading of flow in gas service, it is necessary to know the pressure right at the outlet of the meter (before the valve). Pressure and temperature maximums must never be exceeded. Thermal dispersion instruments work on the basis of heat transfer. The sensing probe consists of two separate components, both RTDs (temperature detectors). One RTD is used as the reference point and measures the temperature of the fluid right where the probe is immersed. The second RTD is self-heated to a known temperature and maintained. A resulting a temperature differential is created between the two RTDs. By varying the power to the self-heated RTD, the set point can be changed which allows the user to set the instrument for a specific application. Convective heat is the mechanism of heat transfer for thermal technology level switches based on the principle that a liquid has a thermal conductivity far greater than the thermal conductivity of its corresponding vapor. When the sensor is dry, there is a temperature difference between the two sensors. When fluid comes in contact with both RTDs, there is a cooling effect as the liquid absorbs the heat from the self-heater RTD. The resulting temperature differential drops, and creates a point for high level reference. When the level drops and the sensor goes dry, the temperature difference increases again. The instrument electronics senses the increase in temperature difference and provides a low level reference. When used for flow applications, the temperature difference under a low flow or no flow condition is controlled by the set point. As the flow rate increases, the sensing RTD is cooled by the fluid moving past the heated sensor - the greater the flow, the greater the cooling. Conversely, the reduction in the temperature differential between the two RTDs indicates that the flow rate is exceeding the set point of the instrument. The Transit-Time Difference method exploits the fact that the transmission speed of an ultrasonic signal depends on the flow velocity of the carrier medium. Similar to a swimmer swimming against the current, an ultrasonic signal moves slower against the flow direction of the medium than when in flow direction. For the measurement, two ultrasonic pulses are sent through the medium, one in the flow direction, and a second one against it. The transducers are alternatively working as an emitter and a receiver. The transit-time of the ultrasonic signal propagating in the flow direction is shorter than the transit-time of the signal propagating against the flow direction. A transit-time difference, Δt, can thus be measured and allows the determination of the average flow velocity based on the propagation path of the ultrasonic signals. An additional profile correction is performed by proprietary FLEXIM algorithms, to obtain an exceptional accuracy on the average flow velocity on the cross-section of the pipe - which is proportional to the volume flow. Since ultrasounds propagate in solids, the transducers can be mounted onto the pipe. The measurement is therefore non-intrusive, and thus no cutting or welding of pipes is required for the installation of the transducers.